Two 20-year-old music fans who attended last month's Rocklahoma festival in Pryor, Oklahoma have been found dead in a vehicle in Lake Eufaula. The bodies of Cody Parrick and Ben Babar were recovered Sunday night (June 7) from a car submerged at the Onapa boat ramp in McIntosh County. According to the Oklahoma Highway Patrol, troopers were notified around 7:30 p.m. of a submerged vehicle at the Onapa boat ramp in McIntosh County. It does not appear that foul play is involved at this point and investigators believe the deaths were accidental, though the investigation is ongoing. A statement from the Oklahoma Highway Patrol confirmed that "two male subjects inside [the vehicle] have been identified as the two missing subjects from Rocklahoma." 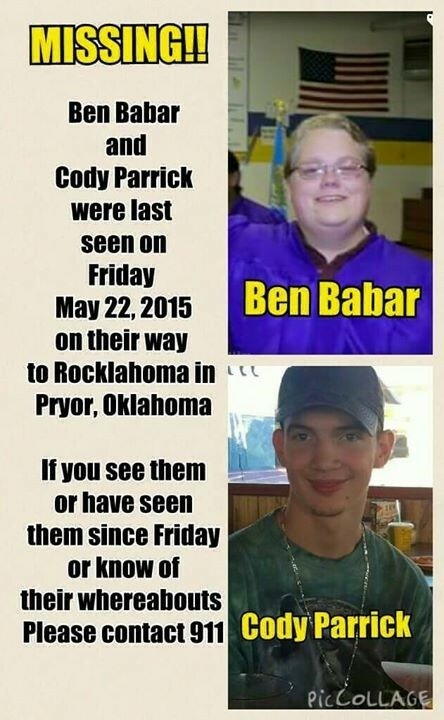 Cody Parrick and Ben Babar were last seen on May 23 when they were supposed to leave the event for work but never made it. They were also seen the previous night at a leather store in Weleetka. Rob Zombie, who didn't perform at this year's Rocklahoma, wrote on his Facebook page: "For all of you who have been asking about Cody and Ben, we have some horrible news. Everyone's worst fears have come true. "I never met Ben, but talked to Cody at one of our shows about his movie ideas. Most of which were really crazy and really great. He was a really funny kid and I'm sure a true joy for the people who knew him. Our hearts go out to their families." Due to the inclement weather, the organizers of Rocklahoma festival canceled several performances scheduled for May 23, including those by LINKIN PARK, VOLBEAT and IN FLAMES. Tornadic storms with heavy rainfall pushing through eastern Oklahoma caused widespread flash flooding in the area.